The “Super Moon” of August 10, 2014 sure was big! This full moon was not only the closest and largest full moon of the year. It also presents the moon’s closest encounter with Earth for all of 2014. The moon will not be so close again until the full moon of September 28, 2015. In other words, it’s not just a supermoon. It’s the closest supermoon of 2014. More on the “Super Moon” at EarthSky. 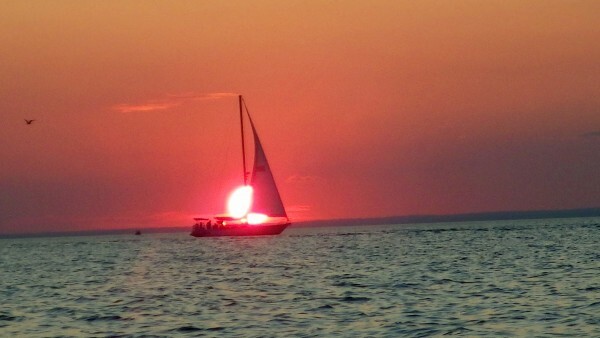 Buddy, Steve, Bob and Paul took advantage of the perfect weather and temperature last night to view this phenomena. We left John Burns Park in Massapequa at 7 pm to catch the setting sun. With light wind and a clear sky it looked like we would have optimal conditions for our trip out into South Oyster Bay. After viewing the glorious sunset over the water we turned our kayaks about 180 degrees and viewed the moon come up over the horizon. We drifted along in shallow water as darkness closed in and the moon rose to reach its maximum intensity. 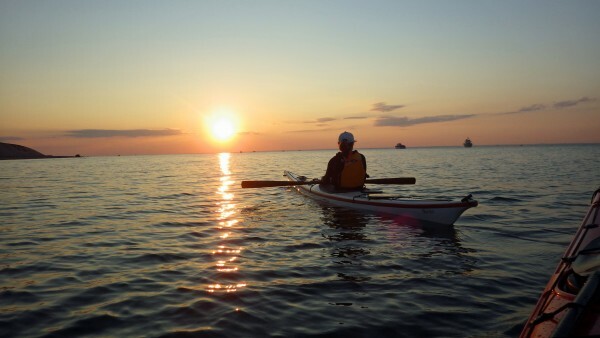 Paddling the bay in the darkness is a matter not to be taken lightly. Everyone was lit up with multiple lights and reflectorization and we all carried VHF radios. While most of the bay is very shallow we knew we had to cross two boat channels. We did so in a tight formation and a quickly as possible. It was here, in the deeper water that we encountered the strongest current. In spite of Jones Inlet being miles away, the water rushing in from the ocean was still moving us to the east. 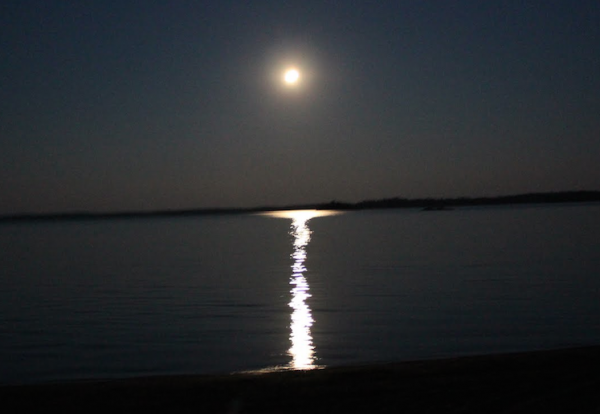 The full moon always creates unusually high tides and strong currents but the Super Moon effect creates really high tides and strong currents which we experienced on our return paddle. Islands in the bay were partially submerged and extensive mats of eel grass filled our path, clung to our paddles and covered our kayaks. Having had the opportunity to view the Super Moon over the water was truly a unique experience. 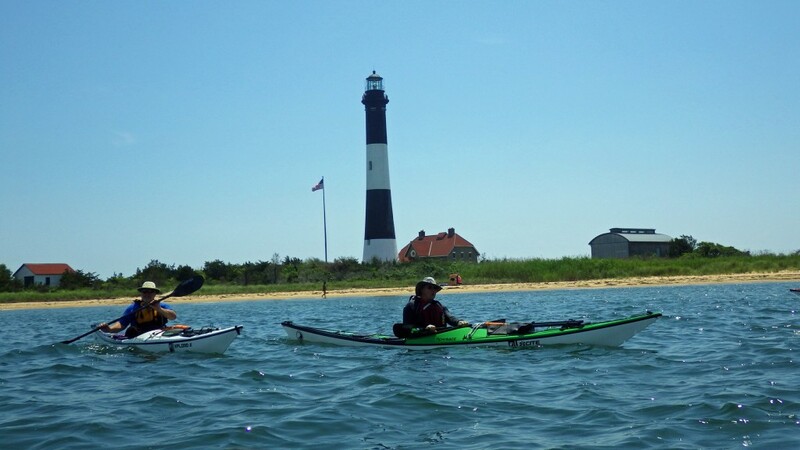 North Atlantic Canoe & Kayak members recently paddled across the Great South Bay to Sailors Haven on Fire Island. 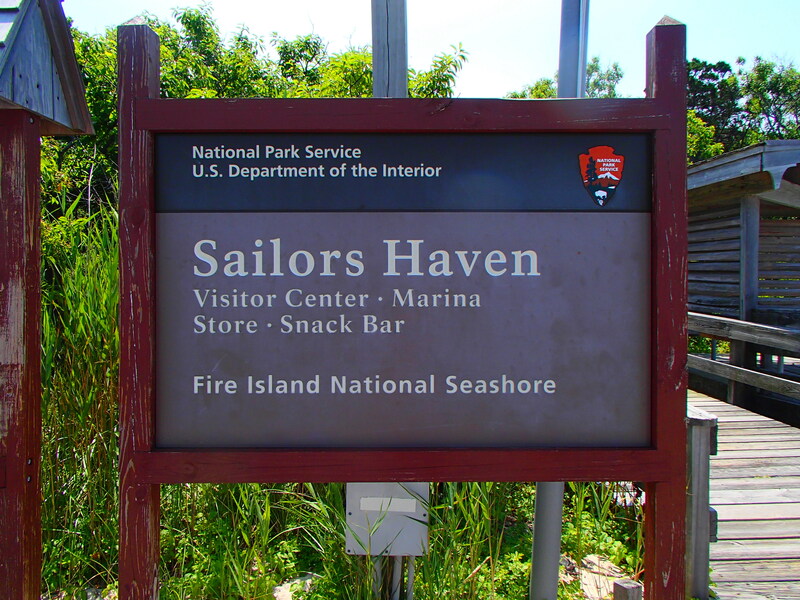 Situated on the barrier beach, Sailors Haven is considered “The Jewel in the Crown” of the Fire Island National Seashore, combining the Sunken Forest with a magnificent, wide ocean beach. 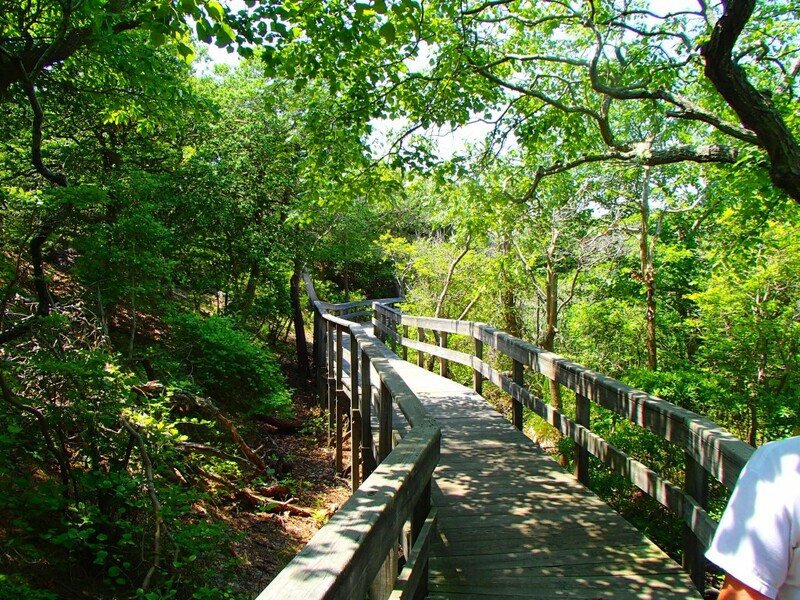 The ancient history of Fire Island is alive at the Sunken Forest, an enchanting 300 year old primeval holly forest, which is the only one of its kind on the East Coast. Under a diverse canopy of leaves, a 1.5 mile board walk meanders through freshwater bogs filled with a variety of trees and shrubs, such as blueberry and red maples; the maritime forest with its American holly and catbrier; and the swale between the dunes, with its grasses and low growing evergreens. I just had the great experience of going on two different NACK paddles in less than 12 hours! 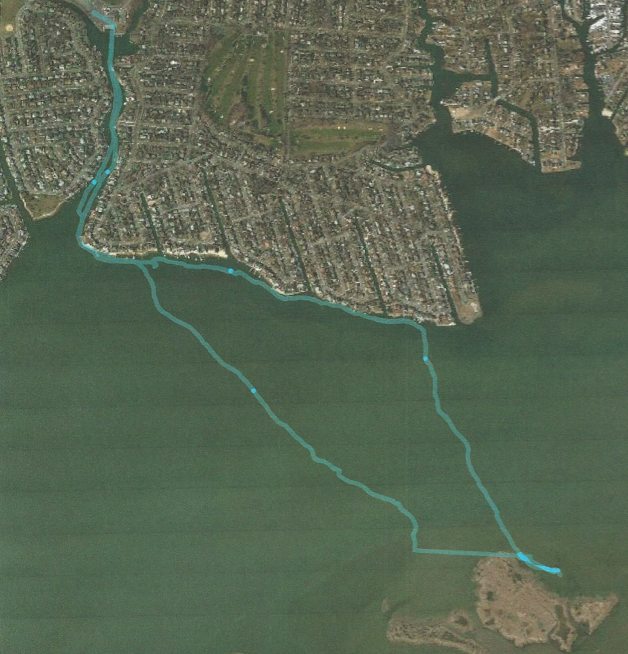 (See below for the Fire Island Light paddle) And they certainly couldn’t have been any more different. 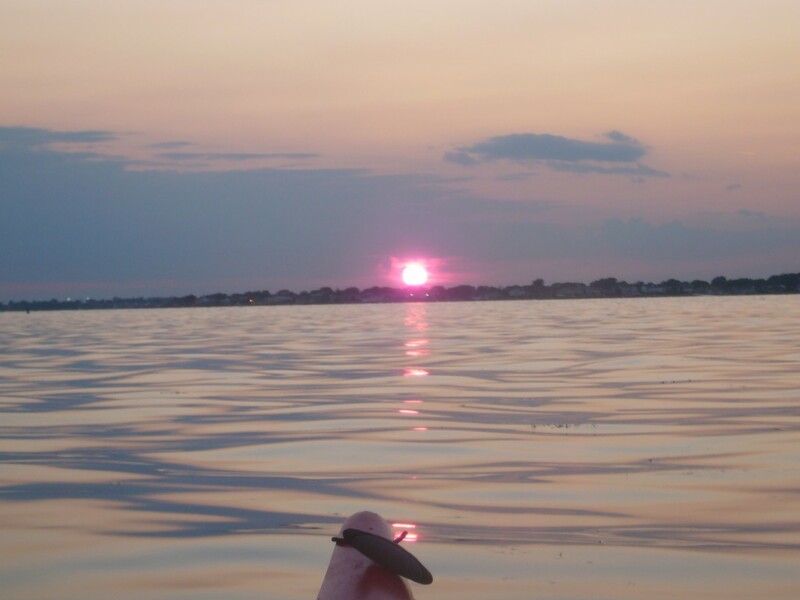 Friday night’s Sunset/ Moonrise/ Fullmoon paddle from Mt Sinai Harbor over to Port Jeff harbor was literally picture perfect. Totally clear skies, warm water, warm air with just slightest Summer breeze made for an incredible evening on the water. Add in some wildlife sightings (mute swans at the launch, three deer on shore next to the cabanas at Shack Beach & an Osprey at home for the evening right at the PJ Harbor entrance) and all I can say is wow, just Wow. So enjoy the photos but don’t get caught sitting it out again and the miss out on the next one! More pics are linked here. On Saturday morning 6 of us met over at Oak Beach for a 9:00am set off. An easy channel crossing, with all the powerboaters seemingly sleeping in & favorable currents going our way, got us over to our destination at Fire Island Light ahead of schedule. 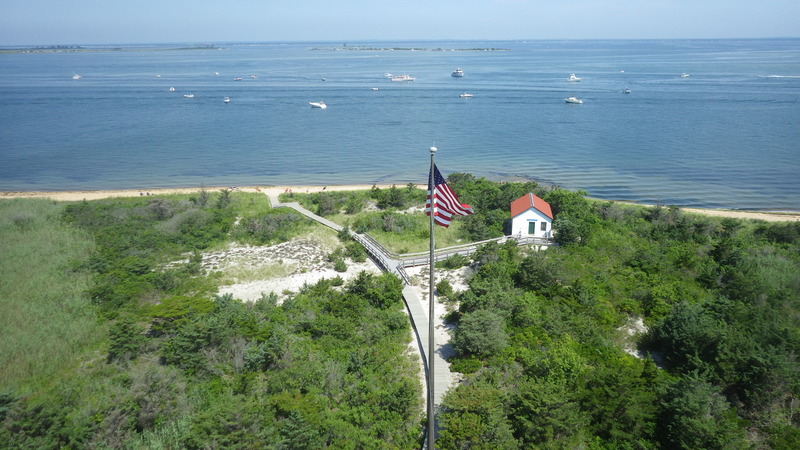 Plenty of time to take a nice tour to the top of the lighthouse, getting a history lesson every step of the way up the winding 156 year old staircase. Just amazing. Built in 1858 in less than a year for just $40,000!! Double walled and constructed from the inside out using the steel stairs as scaffolding, the 11’ base walls tapered off to 2½’ wide up at the top (167’ high). Once we had reached the top, the incredible 360˚ views were just awesome. We couldn’t have asked for a better day… After some photo-opping on the balcony we made our descent back down the 17 story structure & spend a little time & money at the gift shop. A nice little lunch break back by our boats and we were on our way again. An easygoing leisurely pace back (with the current once again in our favor) made it a totally enjoyable 2nd half of the trip. 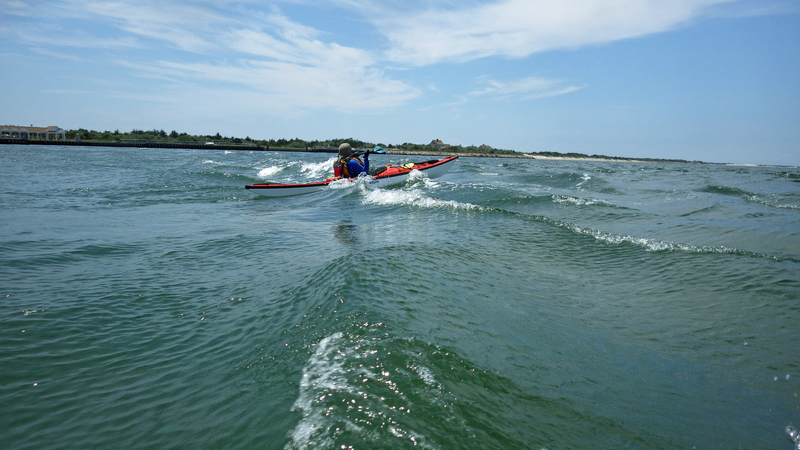 With a little wave riding off of the boat wakes, a little dipping off a neighboring bow for some instant cooldown and a few squirrelly tidal swirls to go through made this anything BUT some boring flatwater bay paddle. So, to wrap it up let me just say good luck to Bob with his brand new boat, congrats to MaryAnne on her first ever bay crossing and special thanks to Steve for planning and leading us on such a wonderful outing. Thanks also to John, who as our backup tripleader was tasked with keeping an eye out for rogue powerboaters heading our way. (there were plenty of them!) The TripPics are all linked here. –Alan M.
The Summer Newsletter is now available with lots and lots of pictures. 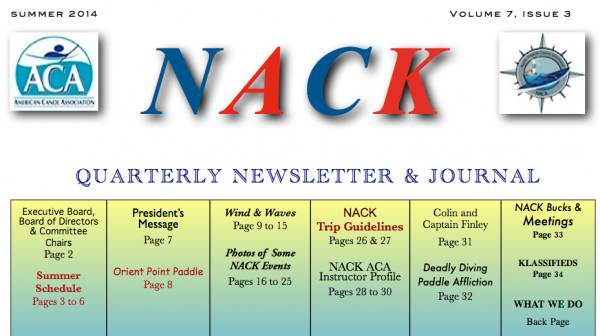 The North Atlantic Canoe & Kayak Summer Schedule 2014 (third quarter) is now available. Paddling trips, training and assessments and practice sessions and more! 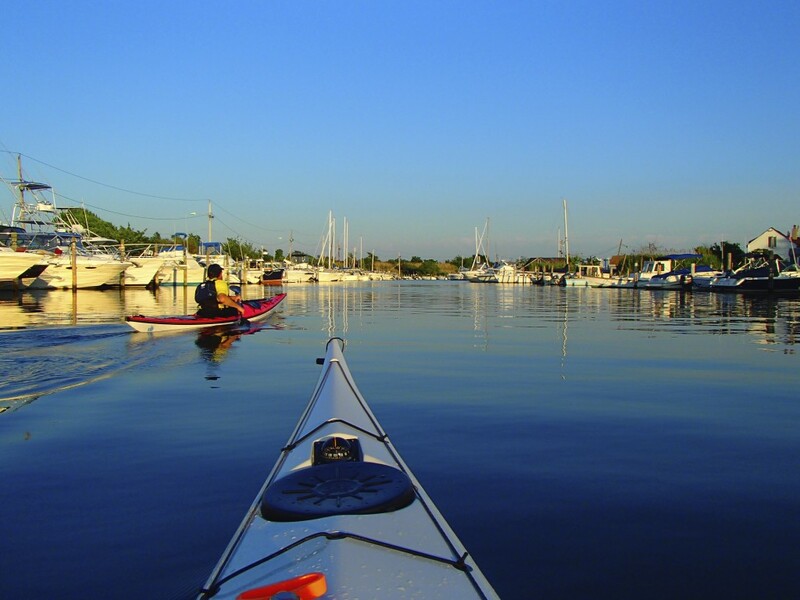 It’s time to get out on the water. For the latest version updates will be posted to our Schedule Page as they occurr. 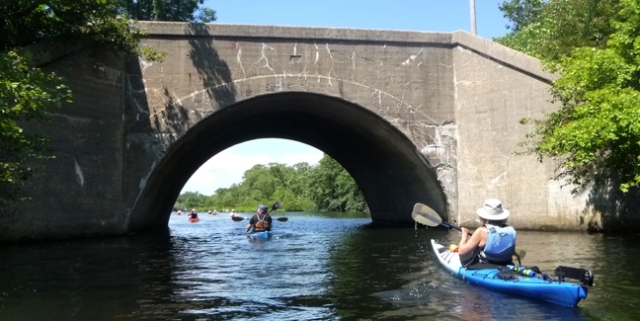 North Atlantic Canoe & Kayak again celebrated the arrival of the summer season with an open paddle on the Browns River in Sayville. 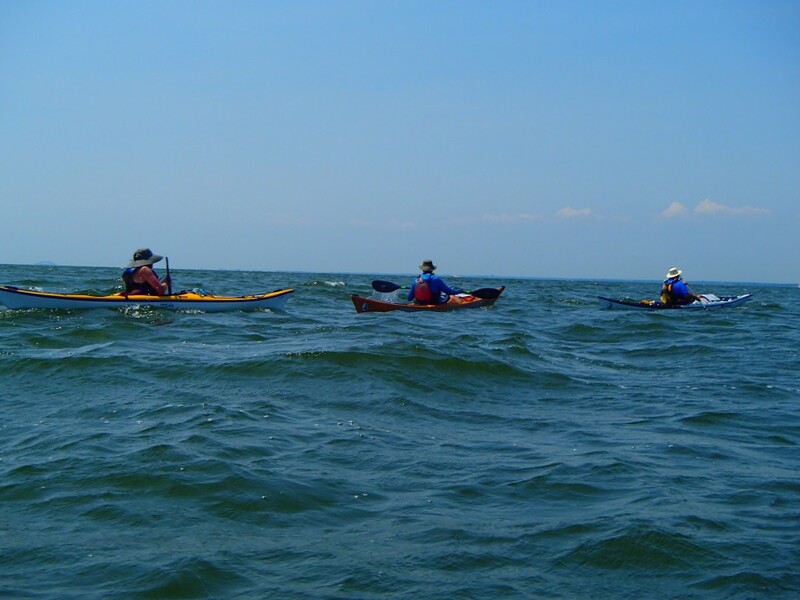 Members and guests ventured out from Captain Kayak onto the river and followed it out past the breakwater into Great South Bay. The refreshing trip was followed by a brief meeting and pizza party at the shop. Many thanks to Jerry at Captain Kayak for allowing us to use the shop. Lynne, Paul, Anne & Mike, Julie & Bob all had a delightful paddle Tuesday. 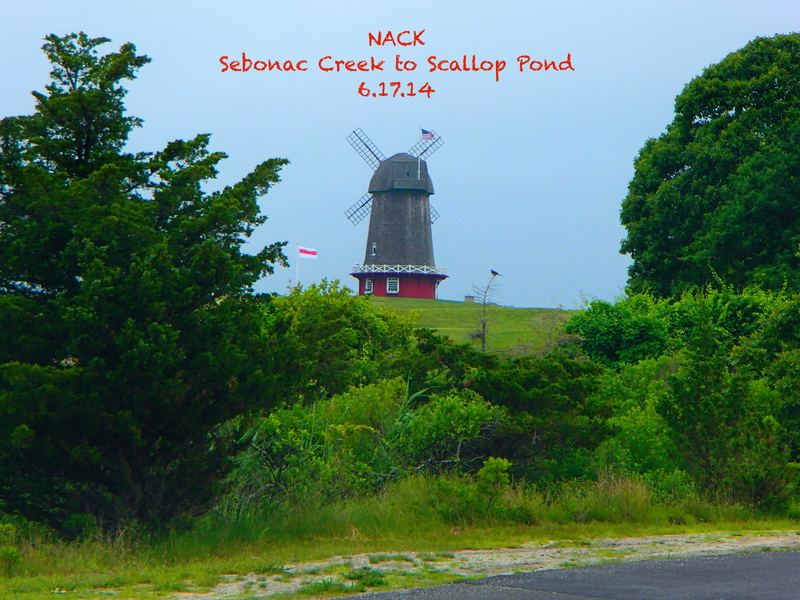 Sebonac Creek, Southampton, is a beautiful spot and it is wonderful that such an exclusive area like this allows free on-street parking for non-residents. It was a very “weather” dependent day. In the morning, it was raining hard in some south shore locations, and hardly raining, if at all, in others. We wondered “weather” we would have a storm. We wondered “weather” it was going to get foggier. We wondered “weather” it was going to get sunny. We wondered whether we would find Bob’s dropped camera; we did not. It turns out there are “Drowning Pools” all over Long Island. We wondered whether the ospreys had already fledged, because they were not seen on their platforms. We found out later that they were spending some time at the numerous duck blinds. For a short time we wondered whether we could easily find Scallop Pond; we did with the help of an app on Lynne’s iPhone.